and then spend hours … or weeks … learning them? What if you could create arrangements on the spot? What if that suddenly gave you a repertoire of hundreds of tunes people love? And built your confidence like crazy? Log-In Here and look for the “Hip Harp Toolkit” Badge. Feel the Power of YOUR Creative Spirit Unleashed in YOUR Hands! 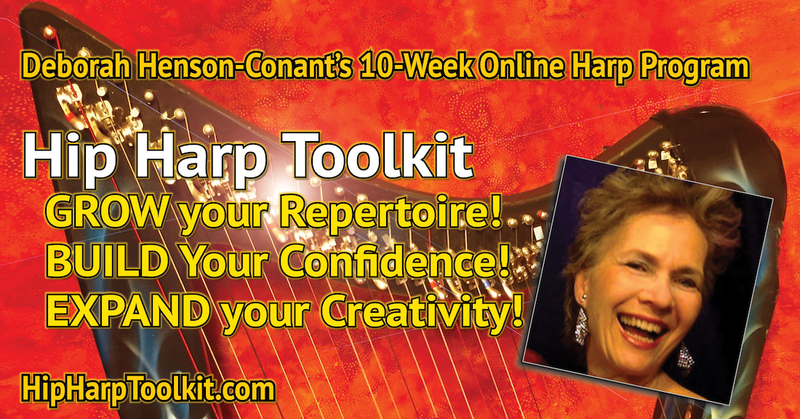 “Hip Harp Toolkit” is an 10-Week online course exclusively for passionate harp players! You learn create a whole repertoire of inventive, fun solo arrangements. My “Arrange Yourself” formula that let’s you turn ANY simple melody into a whole arrangement on the spot! Every one of these arrangements is specifically for your skill level … because you create them yourself. To make it even easier we give you dozens of tunes to use – including nearly 30 Holiday Tunes, and a set of Celtic and Latin tunes – nearly 100 tunes in all – that you’ll be able to just sit down and play using a formula for creativity. Yes, this is a formula for Creative Expression and Connection! Does that sound like a contradiction? The formula gives you a foundation, a ‘safe place’ from which to get more creative. From there you learn to EXPAND simple tunes, SIMPLIFY complex ones, and use all kinds of cool techniques like variation, vamps, improvisation, introductions and codas to create your own arrangements – so you can stop worrying about the notes on the page, and start playing the music you love for the people who you want to connect with. This isn’t just a series of training videos. You also get my hands-on video direction and the luxury of 10 weeks to explore and expand, with weekly chats, answers to your questions, the potential for video feedback on the homework and final project you submit – PLUS lots of fun! I’m with you every step of the way – from October 30 through the end of 2018 (with holiday weeks off) — and a review session in January — to support you, answer your questions, give you feedback and cheer you on as you USE the Holiday season to explore and expand your creative expression, while you share your unique love of music with the world. SO GLAD I TOOK IT NOW! “If I had only read about this course, I would have thought ‘I would love to take that some day when I’m good enough!’ . . . I’m so glad I took it now! How do some musicians create arrangements seemingly ‘out of thin air’?? How do others take a complicated piece of music and simplify it? 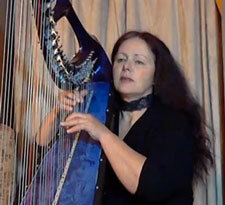 Watch this video I made to solve an arrangement problem for a harpist recently – then sign up and learn to develop skills, tricks and talents like the simple, effective and FUN ones I outlined in this video! And best of all, when you’re in the Academy, you’ll be able to ask me questions as we go along, get direct input on what you’re learning as you apply arrangement skills to tunes you already know … or wish you could play! Will these techniques work on absolutely any tune? NO! You’ll also learn how to identify which music is likely to be easy to arrange and which pieces are going to be tricky, no matter what. with what you ALREADY have right now. 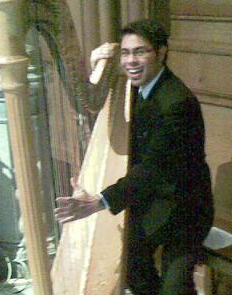 Hip Harp Toolkit is the BASIC ARRANGEMENT PROGRAM at Hip Harp Academy. You can sign up for this SINGLE Class or … when you sign up for the full YEAR-LONG Academy, this class is part of the Full Year-Long Curriculum of nearly a dozen courses. 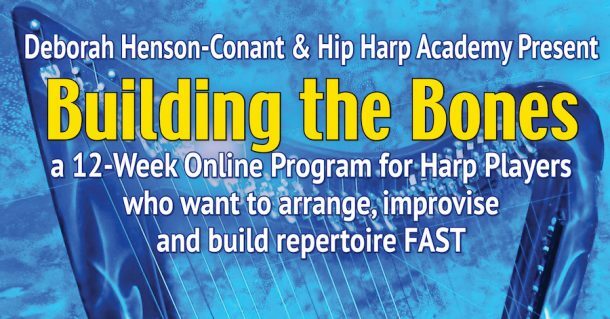 “Hip Harp Toolkit” is one of the BEST programs to begin your Academy year with because it includes many of the fundamental concepts and it’s so easy to immediately use what you learn to expand your repertoire. That’s also why I offer this class in the FALL: because it’s such a great tool for developing and expanding any repertoire – including Holiday repertoire – whether you’re playing professionally, or entertaining your family and friends (or your houseplants — and trust me, they do like holiday music – of all holidays). Join me for this foundational course – including online trainings, Live online Q&A chats, and post-course review-at-your-own-pace access for as long as you’re a member of the Academy. And if you have any questions about that, just use my “Ask a Question” form to ask me directly. OPTION 2: BEST DEAL! FULL YEAR! 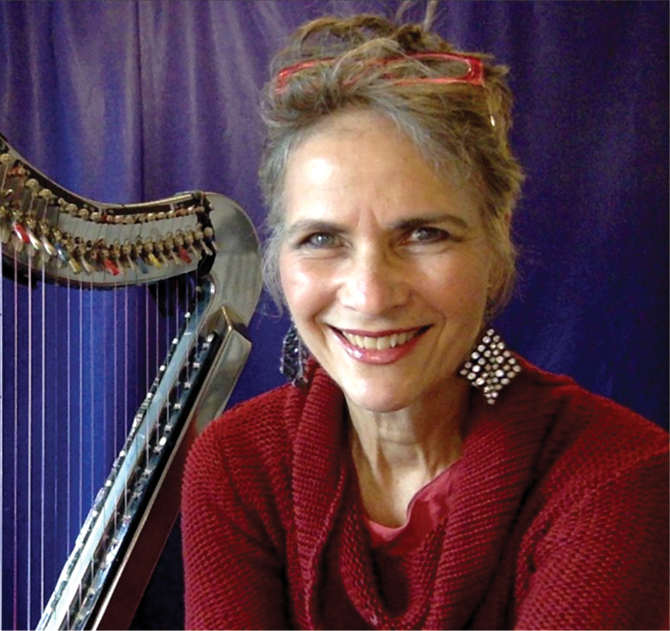 Membership lasts for One Year and includes ALL courses in the Year-Long Curriculum including Hip Harp Toolkit / Arrange Yourself plus a dozen additional classes. 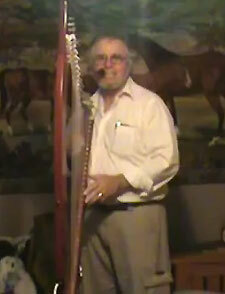 and ALL the courses included, in addition to “Hip Harp Toolkit”! Email your questions and I’ll try to get back to you ASAP with an answer! 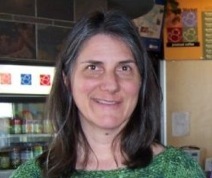 I’m Deborah Henson-Conant, and I’ve been composing, arranging and creating shows since I was a kid. I now play shows with symphonies and on solo stages with the electric harp that was created for me by CAMAC Harps, the “DHC Light”. But I started on the ukulele, playing and singing my own little-kid arrangements. And guess what? I use a many of the same skills and principles to arrange the music I record and perform today – including the Grammy-Nominated album “Invention & Alchemy” and the song that won first prize in the International Songwriting Competiton (ISC). and now I want to give it to you. When I was a little girl, my mother taught me how to play ‘with’ music. She wasn’t trying to teach me to be a musician, she was just trying to show me how music ‘works’ so that I could play with it on my own — the same way she taught me everything else. I honestly thought everyone knew the basics of putting the bones of music together to make a living piece of music. But in the past few years as I’ve taught more students and workshops, I discovered that many musicians are at the mercy of the written page, even when it comes to creating simple arrangements — and that’s true whether they’re beginners or professionals. In other words, it’s not a matter of technical skill, but of understanding the concepts and knowing how to put them into practice. I realized that these concepts are the foundation of everything else I want to teach harpists, from Blues, Jazz and Flamenco to how to create your own one-person show. So I created “Arrange Yourself” for my first online course so that harpists could start playing ‘with’ music immediately, whatever their skill level. 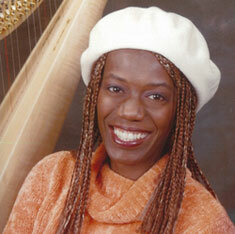 Then I created “Blues: Harp-Style” to teach harpists the fundamentals of playing Blues. And then … I realized that simply having the skills doesn’t guarantee putting them into action, and putting them into action is what helps us solidify them so they become a part of our own artistic expression. That’s why I created “Hip Harp Toolkit:” So that once you have a handle on the basic skills, we can continue to work together, so I can answer your questions and coach you as you put them into action. I’m excited to help you create a structure you can build on for years and years as you continue to grow as a musician for the rest of your life! “This has been the best workshop ever! I like having plenty of alone time to work with the concepts in the lessons. It’s the foundation of all my other courses. This is the course I created to help people really get their hands on the FOUNDATION of improvising arrangements – literally! Here are just 10 of the reasons this course ROCKS! YOU GET MY SECRET FORMULA! It’s the formula at the HEART of most of the music we hear from jazz to classical sonatas! You’ve heard it thousands of times – but it’s a secret because it gets so altered and embellished that you don’t hear its basic structure. So I’ve distilled it (Mwaaaa-haha!!) it into a BASIC 5-Part Formula that YOU can use over and over and over – to turn any simple melody into a improvised arrangement of any length and any complexity! WHEN YOU SUBMIT HOMEWORK EACH WEEK, YOU HAVE THE CHANCE FOR PERSONALIZED POSITIVE FEEDBACK FROM A MASTER TEACHER. I choose 4-5 homework examples to use for feedback each week and students say that the feedback is one of the most valuable parts of the course and the most confidence-building. With my own colleagues, we learned that ‘critiques’ are counterproductive – so my feedback always starts with what IS working because that’s the hardest thing for people to see in their own work! YOUR ARRANGEMENTS GROW WITH YOU! Imagine playing a tune you love, getting it in your fingers, hearing people hum along … and then hearing it DEVELOP, as you develop over the years! Imagine hearing it change and grow as your skills grow. Imagine that it gets easier when you’re tired, so you don’t have to work so hard! Imagine it gets flashier when you want to impress people. THAT’S EXACTLY WHAT HAPPENS when you learn to create spontaneous arrangements because they change as YOU change! YOU GET TO PLAY LIKE YOU!! Forget “Beginner,” “Intermediate” and “Advanced” – the truth is that each person plays at their own personal level, with their own strengths and their own challenges. So I help you tailor the material to YOUR technical level whether you’re a professional who wants to create a flashy set of musical variations, to a fledgling who wants to be able to sit down and have FUN! WAIT! There’s one more really important one! WE GET TO DO THIS TOGETHER! 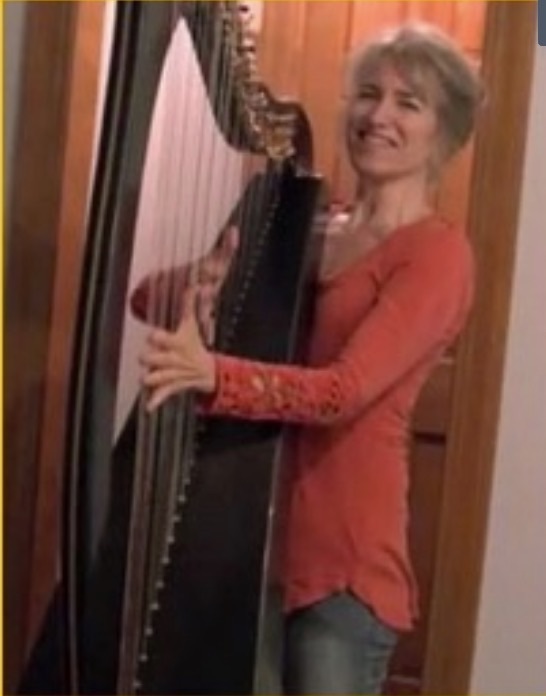 Sure, you could take all the videos, handouts and audio files from this course and work on them on your own and you’d be getting soooooo much that way – BUT I’ll be WITH you each week when you take the course during the interactive, guided session I lead each year in “Hip Harp Academy,” answering your questions through the Facebook Group, the “Ask a Question” form and the weekly chats, giving you personal input and totally LOVING having this adventure with you!! Watch this video I made to find out WHY I created this course. There are plenty of books about arranging, but there’s nothing for harpists about arranging for yourself on the spot, at your own level so you can experience the thrill of playing the tunes you want to without having to learn an arrangement! I created this course to teach you the way I learned myself and to walk you through it personally, step by step, with plenty of time for questions and coaching. 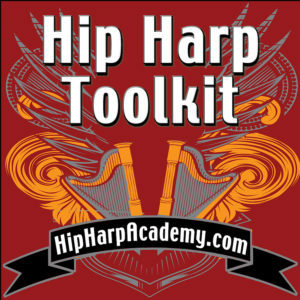 “Hip Harp Toolkit” combines my basic “Arrange Yourself” curriculum along with resources, games, challenges and reviews to help you implement what you learn so you can start playing your new repertoire quickly, and then incorporate what you learn into everything you play. I give you the basic “Arrange Yourself” curriculum in weekly video modules so you’ll be up-and-running on creating your own arrangements quickly PLUS I provide four different repertoires you can choose from (or mix and match) – simple tunes – Holiday Favorites, Latin Favorites, Celtic Favorites and my own originals created especially for this course — all in the same tuning (C major / A minor) – so you can focus on learning and implementing the CONCEPTS instead of fussing with changing key or dealing with levers. I want you to gain FLUENCY. That goes for every technical level of player, and why I’ll be there live on the chats to help you – so I can guide fledgling players in how to simplify – and so I can guide advanced players in how to embellish from the basics in ways you’ll be able to then add to all the music you play. By Thanksgiving – at the end of November – you’ll be playing your new repertoire (YES! It can happen THAT FAST if you commit to as little as 30-40 minutes a day at your instrument!) — and we’ll have 6 more glorious weeks together for you to hone that repertoire and share it with friends and family during the holiday season and beyond (AND you’ll get Thanksgiving week off – if you don’t live in the U.S. just enjoy the week to regroup!). 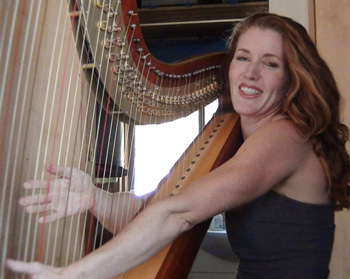 ““This was the single most important musical course I have ever done in years of learning harp, and I would recommend it to anyone at any musical level. To begin with, the course was absolutely jam-packed with incredible information, from beginning to end. Even more incredibly, I could see right away in week 1 that my fears about my harping level were unnecessary; my level simply didn’t matter. I had been searching for this information for years, going from teacher to teacher, but with this one course, Deborah gave me all the tools I needed for arranging music. I want you to be able learn quickly, retain the information, implement it and be able to go back and access what you learned later on. I also want you to be able to repeat this same process every time you want to add music to your repertoire. So the Toolkit includes modules and worksheets: the worksheets I personally use for organizing and structuring my own work and practice. And I want to help you create chances to play! Whether you’re a professional, a fledgeling player or an impassioned intermediate – we talk about creating opportunities to share the repertoire you learn to play – either in paid performances or in community or family events. You get to download all the worksheets, lesson overviews & audio files. I even teach you how to organize them into your own workbook. You’ll have access to all of it for as long as you remain in the Hip Harp Academy – both the lessons and the chats – so you can watch them over and over. The real beauty of this program is that, when you choose to take this course during the Interactive Session, I’m there with you, answering your questions as they come up and coaching you during live weekly sessions. This is the best way to have your own breakthroughs and become truly proficient in these skills at your own level. This is why I encourage you to sign up for “Hip Harp Toolkit” during the Interactive session of the course (i.e. Starting Oct. 18, 2017). Of course you can join the Academy and have access to the “Go-at-your-Own-Pace” version of the course any time of year that you join — but this ONE TIME OF THE YEAR when I’m actually leading you through the course is the absolute best time to take it! And I only offer “Hip Harp Toolkit LIVE” ONCE a year! “The first thing I’d like to do is thank Deborah for her combination of pulling me along and building my confidence along the way. The other class members, as well, have been so supportive. Once you register, you get access to the classroom and you can go there any time you want and work at your own pace, watching pre-recorded training videos where I show you step-by-step what you’re learning each week. In the guided, interactive version of the course that I lead each year, we focus on one module each week, and each week includes a homework challenge or a game for you to play with the concepts. Once each module of the training is opened you have access to it as much as you want – for as long as you’re a member of the Academy – so you have plenty of time to review and download the material. You also get a downloadable MP3 of all the lessons and PDF overviews and worksheets, to make it easier to review the class later. Each week there’s a LIVE chat, and it’s the only live portion of the course. It’s usually on Sundays around 2pm Eastern Time. It’s always recorded – some people love coming live and others submit their questions via the “Ask a Question” form and watch or listen to it afterwards. I encourage everyone to do the homework – but it’s not obligatory. For those who really want to dig in and get the most out of the programs, you can do ALL the homework, ALL the projects, ALL the challenges – and really get an incredible amount out of the program. Some people prefer to do the trainings “at your own pace,” and ignore the guided program schedule. Some people get the most from coming to the weekly chats, or downloading them and listening while they drive or exercise. Some people just come when they can, and take what they learn and apply it to their music. Some people attend everything live and do all the homework, and submit all the homework. Do it the way that works for YOU! The 4th – and most important – is YOU! The ABILITY to ARRANGE on the spot at your skill level from any simple melody with chords — including the ability to simplify if you’re a fledgeling player – and to enhance and embellish if you’re advanced. ‘Write Out’ the CHART of an arrangement (so you can remember how it goes) …whether you can read or write music … or not! Weekly homework assignments and a chance to have my personalized feedback on your homework if you submit it for feedback! You’ll also get todownload all the MP3s and PDF materials and keep them in your own class binder (I even show you how to make that binder) and you have access to the classroom as long as you’re a member of the Hip Harp Academy so you can come back over to review the videos, add comments and keep on interacting with your classmates. “Hip Harp Toolkit” lasts for 10 weeks. There are 8 modules of content, but I like to add catch-up and review weeks to help people assimilate it. HOWEVER … you can get all the “Arrange Yourself” and repertoire-building content within the first 6 weeks,. “Arrange Yourself” is the arrangement training at the heart of “Hip Harp Toolkit” – and the Toolkit also teaches you how to package and share that content if you want to create arrangements as gifts for friends – or for professional use. You actually start implementing the ideas in the course after the first week! I just find that having time for review, catch-up and fun ‘challenges’ that help you apply the material, helps people actually integrate what they learn. We take off Thanksgiving week and we’re done with content by early December to give you time to enjoy the holidays – and play your new repertoire for friends, family, profit (oh yeah!) – and your own entertainment! But we continue the chats into December so that people can continue to ask questions and share what they’re doing with their new arrangement and repertoire-building skills. Each week the course information is provided in three formats: Audio, Video & PDF. There’s also a live online Q&A chat where you can ask whatever you want to help you understand, integrate and thoroughly enjoy all the material in the course — and if you can’t make it to the chat, it’s recorded so you can watch or listen to it later. I encourage everyone to do the homework because each homework assignment guides you step by step to creating your own arrangements. Maybe even more importantly, when you do the homework, the questions that YOU need answered will arise. When you ask those question, I can pinpoint my answers to help YOU. This, for me, is one of the most important reasons to take an online class with the instructor available – and why I encourage people to sign up for “Hip Harp Academy” when I’m giving the Guided Interactive versions of each course, even though the course material is available any time for you to learn at your own pace once you join the Full Level of the Academy. Here’s why it’s so meaningful to learn with an instructor who can answer YOUR questions: People will tell you that “you can find the answer to anything you want on the web” – but that’s like saying you can find a particular seashell you want because all the shells are in the ocean. The value of having a guide and a coach is that they can guide you to what YOU are looking for, instead of you having to spend all your time sifting through way-too-much information to find out what works for you. WHAT EXACTLY IS THE HOMEWORK?? Almost all the homework includes createing a short arrangement (no more than 90 seconds) so you can play with the concepts from each module. If you’ve signed up for the VIP Level of the course, you’ll videotape that 90-second arrangement for me and then I’ll give you my own personalized feedback via video, pointing out what’s great about what you’ve done (because most people can’t see that!) and giving you suggestions for taking it to the next level. WHAT IF I FEEL ICKY ABOUT SHARING VIDEOS?? Well … you can either challenge yourself through your ickiness, or you can not share videos. There are a very limited number of “VIP” slots that allow you to share videos with me privately but those slots are not always available. WHAT IF I'M A TECHNOPHOBE AND DON'T KNOW HOW TO POST VIDEOS? One of the things technophobes (like I was!) love about this course is that they become so more web-and-tech savvy just by taking the course. I have a short tutorial to help you learn to create videos, submit them to YOuTube and keep them out of the public eye! WHAT KIND OF FEEDBACK DO YOU GIVE? I usually choose 5-6 videos each week (usually the ones where people are asking interesting questions, or specific advice about how to do something) – and I give my feedback via video, usually with your homework video right beside mine – so that I can watch your video and then comment immediately in the moment. It ends up looking as if we were in the same room together. My feedback almost always focuses on what you ARE doing ‘right’ and how you can take that to the next level, or what’s not ‘clear’ and how you might make it clearer. What you ARE doing is often the hardest thing for people to see. The big value about looking at our work this way is that, by enhancing what we ARE grasping, we constantly move closer to our own personal style. What tend to MISS is what we ARE getting and how to enhance that, and instead, tend to zoom in on what we’re doing ‘wrong’ and inflate it, as if avoiding mistakes was the only way to move forward. Instead, by focusing on imperfect completion, imperfect practice, imperfect action, we focus on what we ARE doing and on how to make what we WANT to be doing CLEARER, and so we become more and more fluent, and we get closer to expressing what we want to. For me that’s just a faster, easier way to get where I want to go than focusing on what I’m doing ‘wrong’ – so that’s how I like to focus my feedback. That’s pretty much up to you. You could spend as little as 20-30 minutes a week if you only wanted to download and read through the PDF – and you can get tons of great ideas that way. Some people who are busy like to do that, and then watch a couple videos and come to the online chats (or watch them later). That’s one way to take the course ‘just for fun’ – and that’s perfectly fine. People who want to ‘get the most bang for their buck’ can spend as much as an hour or more a day, watching the videos, downloading the materials and then putting it all into practice on their instruments, and then submitting homework for feedback. Most people fall between those two extremes – and it’s totally fine how YOU want to use the course and how it fits into YOUR life right now. That’s also why you get access to ALL the courses in the Hip Harp Academy for as long as you’re a member – so you can go back and review. The absolutely most important thing you can do each week is to find one simple concept from the lesson and put it directly into your playing at any level. If you do that ONE thing each week you’ll get more out of the course than reading and watching everything but not putting it into practice. So if you don’t have much time one week, you can skim the lesson, find your ‘nugget’ for the week, put it into practice and feel great that you’re getting something that will change your playing. On a practical level, to just go through the videos and the handout for each lesson each week takes about 60-90 minutes. And you don’t have to do it all at once! I break up each lesson into a bunch of mini-sections so you don’t have to do that all at one time. So you can log in once a day for 10-15 minutes and go through one or two ‘activities’ each time. Most people take the course more than once because there’s a lot of content – and you simply won’t get it all the first time through. Going through it again is what “Spiral Learning” is all about – and that’s why I also have two mini-courses that go together with Hip Harp Toolkit, one from a Celtic Coach (Marta Cook) and one from a Latin Coach (Christina Braga) – so you can take the course several times, add some different flavors each time – and find new ways to put the principles into practice. You can go at your own pace – you can take what you want from the course, you’ll have the PDF handouts and you’ll be able to access the course videos 24/7 to review or learn at your own pace for as long as you’re a Full-Level member of the Academy. Different people will take different things from the course. Sometimes I get one ‘elegant idea’ from an online course that gives me all the knowledge and power I need to shift to the next creative level – which is what I want for you. Sometimes I need to do all the homework and get all the feedback in order to feel I’ve gotten what I need from the course. So I wanted to structure this course so that regardless of which way you like to learn, you’ll be able to get what you need from it. DO YOU PROVIDE MUSIC TO GO WITH THE COURSE, OR DO I NEED TO PROVIDE MY OWN? I provide several sets of lead-sheets you can use – Holiday Music, Celtic Music, Latin tunes and some generic originals I wrote specifically for the course – and even if you’ve never read a lead-sheet I’ll show you how to read these. Once they’ve learned the principles, many people then take them and apply those principles to other music they have. HOW DOES IT WORK WITH THE DIFFERENT PLAYING LEVELS ALL IN ONE COURSE? The way I deal with the different levels is by starting with concepts rather than specific techniques, and then showing how you can build those concepts with basic techniques or with expanded techniques. By “concepts” I mean, for example, a basic arrangement structure is the concept: intro-melody-exploration-melody-coda. Those concepts can be expressed very simply, with very basic skills, or they can be expanded to any level of complexity. These are truly the same concepts I’ve been using, and both expanding and distilling, for the last 40 years. So, what I try to do is to DISTILL the basic concepts of each thing you learn, and from that distilled concept you can play it in a very basic way, or embellish and expand it as far as you want (I’m still exploring all the ways I can do that). The ‘simple’ version is not ‘dumbed down’ or simplistic – to me, the simple is equally as beautiful – and sometimes more beautiful than the embellished versions – it’s just less complex. Since we start with the skeleton of each piece, we can flesh it out at any level of technical ability so long as we understand the basic underlying concept. That’s part of what I love seeing: all the different ways people express these same concepts, based on their own individual skills, innate talents, instruments and preferences! We then have the Q&A chats, and the VIP level coaching option to help fill in any gaps specific students have. Students who want a bigger challenge can ask me for that and I can show them how they’d go further, and students who need it simplified ask for that and I show them simplifications. There is no limit to how much you can simplify or expand a musical concept. That’s part of what fascinates me about music. “Hip Harp Toolkit” lasts for 8-10 weeks. There are 8 modules of content, but I like to add catch-up and review weeks to help people assimilate it.